Visiting bathhouses is such a Hungarian tradition, one of the few really great ones. Most of us have been socialising there since childhood. I have great memories from my home town, where we had good times with family there. I’d lost this way of relaxing in Budapest for a while because I’d just been restless and surrounded by hundreds of tourists. Paskál is not that well known (yet!) – it’s more about the calm, hot thermal water and warm vapor. This spa is new, very modern and cozy. It strikes such a great harmonious balance between being fun and relaxing. 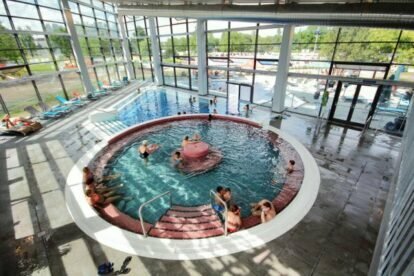 My doctor advised me to come here for my backpain and I just enjoy it – in Hungary, it’s common for doctors to send you to a spa if you have rheumatism or muscle pain, because our water is special. The positive effects of the water help me a lot with this. There are other services, like a sauna, a hot tub and different kinds of medical massages, all with the greatest well-being of your body and soul in mind.